I tried a juice cleanse once. Okay fine, twice. Turns out trying is not the same as succeeding. Suffice it to say, I’m not the juice-cleansing kind. So? Cinderella never juice-cleansed. I don’t think. I’m trying to be more like Cinderella in the new year. True, she’s a bit careless with her belongings (who loses a single shoe? ), but she is kind, works hard, and girl looks good in a dress. Even one made of rags. I’m not delusional; I know that life is not a fairytale, and that no one really looks great in rags. But, when it comes to living right, why can’t we bring a little magic to the table? I mean, we can turn no into yes. Awkward silence into ‘hi, how are you?’ We can call our dads in the middle of the day, just to say hello. We can turn warm cozy laziness into pink-cheeked get-up-and-go. We can turn pumpkins into soup! And eat it, extra warm and brightly orange, for three nights straight. Spoon required. Magic wand optional. I love, love, love the fact that fairytale pumpkins exist. And that they look like Cinderella’s carriage. And that they’re totally edible! If you can’t find one, though, you can easily substitute any other firm winter squash. 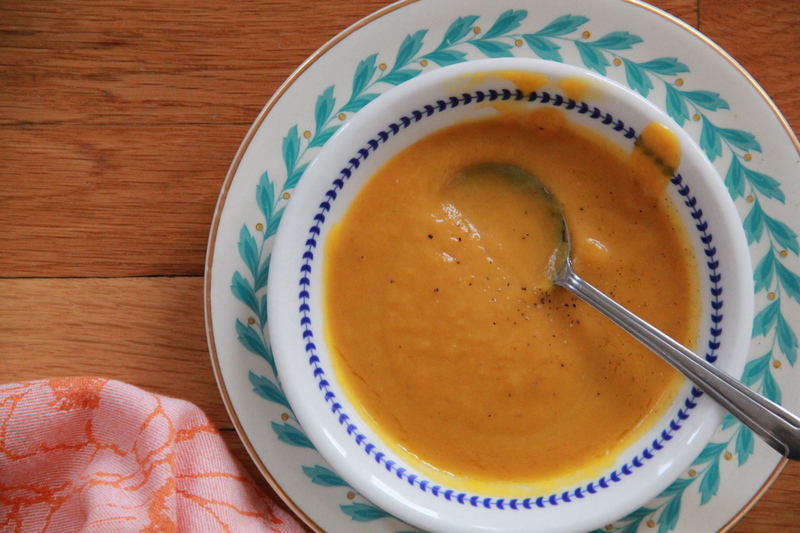 Try acorn, butternut or kabocha. 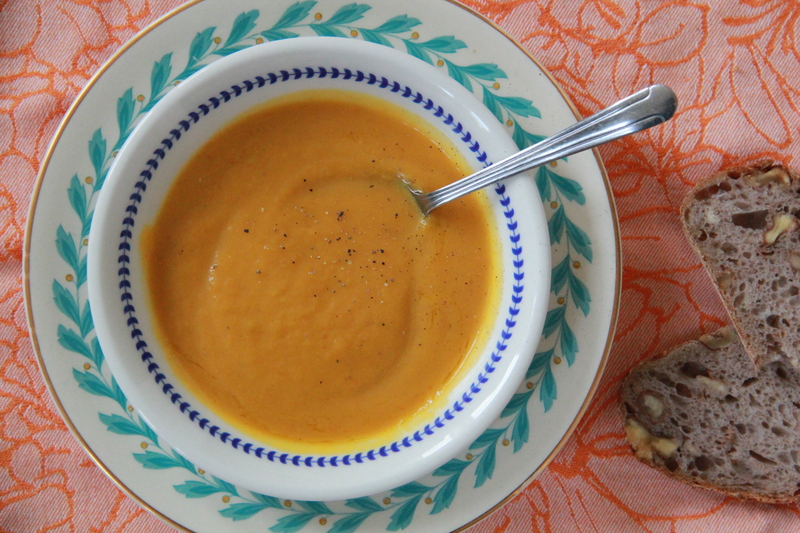 And if fresh squash just isn’t happening, this soup can even be made with canned pumpkin. Magic! In a large pot, melt the butter over a medium flame. Add the chopped onion and leek, and sweat until softened and translucent, about 7 minutes. Add the nutmeg, oregano, and a big pinch each of salt and pepper, and stir to combine. Add the fresh or canned pumpkin and the chicken broth, and bring mixture to a boil. Lower the heat and simmer the soup gently until fresh pumpkin (if using) is tender, about 30 minutes. Once the fresh pumpkin is very soft, puree the soup with an immersion blender (or in batches in a regular blender or food processor). You’ll probably want to puree the soup even if you’ve used pumpkin puree, in order to smooth out and incorporate the soft leeks and onions. Season the soup to taste with salt and pepper. 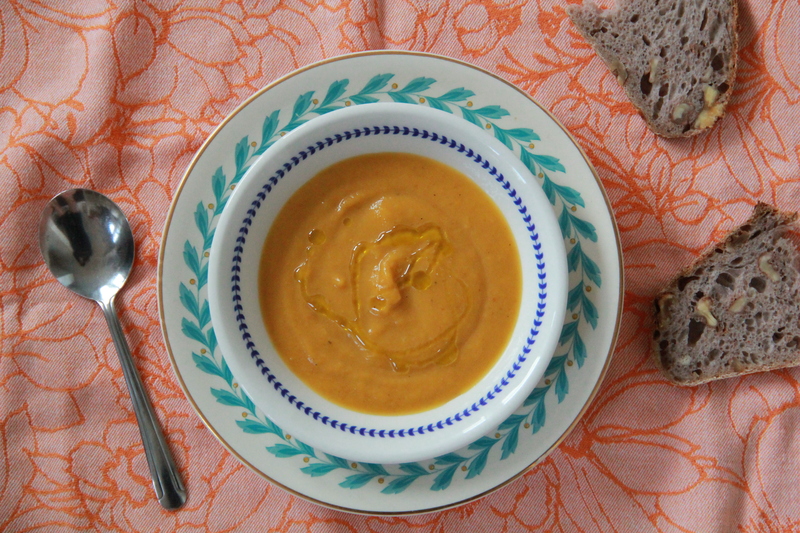 Serve hot, with a drizzle of olive oil or sour cream, and a large hunk of dark bread. Makes about 8 cups soup. What a great idea! I believe you will make a great Cinderella! I will be more like Pocahontas. Sing with all the voices of the mountains and paint with all the colours of the wind. Try and find out what’s waiting just around the riverbeeeeend! Oh man – Disney is the best. Ha! What a fabulous/horrifying story! At least now you have the most legitimate justification ever for new shoes?